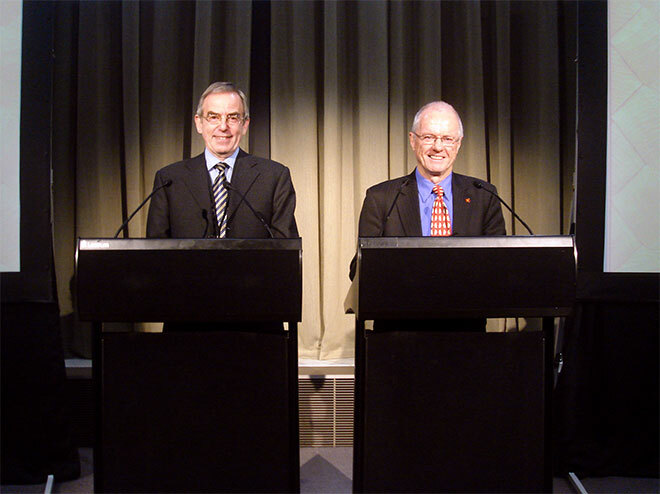 Political scientists Stephen Levine (left) and Nigel Roberts, of Victoria University of Wellington, were Te Ara's Government and Nation theme editors. They are shown in June 2012, when the theme was launched by Governor-General Sir Jerry Mateparae in the Beehive banquet hall at Parliament. Our contribution to Te Ara, a collaborative and creative venture, was unique even for us, with our academic partnership spanning more than three decades. It involved a joint appointment as theme editors, a contractual arrangement unusual for Te Ara and requiring further assurances and approvals before proceeding. We began by drawing up a list of approximately 100 topics, and – after extensive consultations with Jock Phillips, the project’s general editor, and a series of planning sessions – we extended invitations to an exceptionally experienced, well informed, high-ranking group of individuals: a former prime minister, a Supreme Court judge appointed to the International Court of Justice in The Hague, senior public servants, diplomats, authors and academics. As an indication of the esteem in which the Te Ara project is held, only one of the people we originally approached was unable to accept our invitation. The quality of the contributions – and the sheer enjoyment of the project – was significantly enhanced both by the brilliance of the Te Ara in-house contributors with multiple entries, and by the selection of illustrative materials from staff whose commitment and versatility evoked our considerable respect and warm admiration. As individuals accustomed to approaching university staff meetings with a healthy degree of apprehension and scepticism, the Te Ara gatherings, under Janine Faulknor’s and Jock Phillips’s watchful eyes, were (by contrast) events to be looked forward to – for their intellectual quality, sense of shared purpose, good humour and steady progress towards well documented, attractive contributions. A final observation about this enormously enjoyable, valuable and successful two-and-a-half-year effort notes the satisfaction, intermittently experienced, arising out of the fact that, just occasionally, at one of these meetings, we – as theme editors – were able to tell Jock Phillips something that he didn’t already know.